The Celtic Nylon Harp is a small warm and adorable sounding Harp with a height of nearly 39 inch (98 cm) and is mostly used In traditional music. The wooden instrument has a range of three octaves between C2 and C5 (wich we extended downwards to C1) and has got 22 strings which are made of nylon and are plucked with the fngers. The harp has a lever close to the top of each string; when it is engaged, it shortens the string so its pitch is raised a semitone (sharped note if the string was a natural). 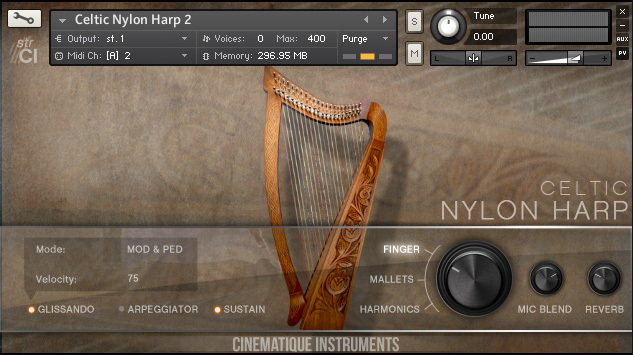 After recording and releasing the harp in 2010, we decided to update the entire instrument in 2015. Three diferent articulations were recorded in two diferent microphone settings on all 22 strings of the Celtic Nylon Harp. Besides fnger picking we recorded additional harmonics and captured the sound of the strings being beaten with a mallet. We extended the low range of the Instrument to reach down to C1. We also added a script which allows the user to play glissandos using the modwheel. In contrast to most glissando instruments this feature has a dynamic detection system which allows only the notes that are currently held down for the glissando. This way playing glissandos becomes much more intuitive and fexible than it would be if you had to select scales or chords globally. On top of that we included a 8 step arpeggiator which is based on Ensemblias voicing engine. Once again the Celtic Nylon Harp forflls the tradition of the Cinematique Instruments Strings by sounding charming, organic and inspiring. normal/ picked, mallets and harmomnics (approx. uncompressed data size about 700MB). restrictions Kontakt 4.22 full versions is required.